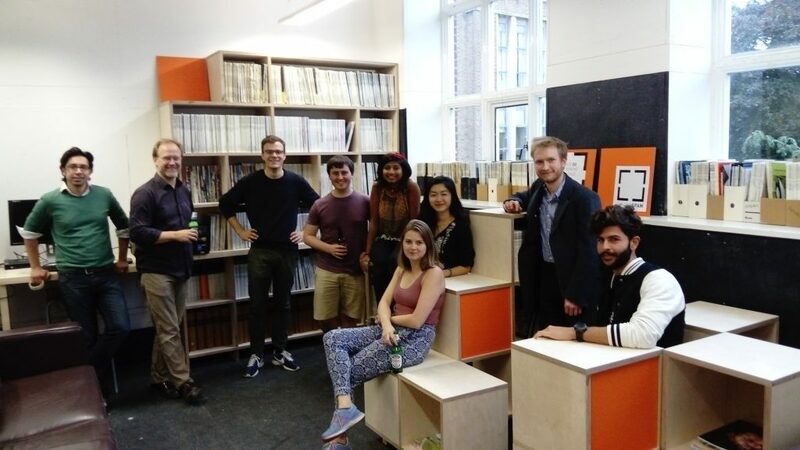 Over the fifty years since Peter had first been a student at the Architectural Association he had amassed hundreds and hundreds of architectural journals and magazines. In many cases there were more than one copy, because he had been a contributor to so many over the course of his career. He had written over 500 articles and was Architectural Journalist of the Year in 1992, the year that I met him. After he died in August 2016, it did weigh on my mind that one day most of them would probably have to be thrown out. Schools of Architecture would already have runs of them and I couldn’t think what could be done with them. But now I am thrilled to say that they have found a home. In September I had an email from Steve Parnell, now at Newcastle School of Architecture, whose Ph.d on architectural journalism Peter had supervised. Steve was planning a project by and for students called the MagSpace, and would be very happy Peter’s journals. What, all of them? I asked. Yes, all of them. One week-end it took me a day and a half – with assistance – to assemble journals and magazines from various corners of our house. On the Monday morning Steve briefed a small group of students: they had until 4 o’clock on Friday to design the lay-out of the MagSpace, plan the shelving, make it in the workshop, assemble it and arrange the journals. On Monday afternoon Steve drove down from Sheffield in a van, we loaded up the journals, and he took them back to Newcastle. It is wonderful to think that they will be used and enjoyed instead of gathering dust in the attic. It is poignant to think of Peter buying the earliest ones as a student – at a time when he was very hard-up – little knowing that one day he would be such an eminent critic and historian and that the magazines would be consulted by other young people at the start of their careers. I am glad that the baton should be passed on in this way. And he would so much have approved of the students participation in planning and making the space. It is perfect in every way and I want to thank everyone involved. AFTER: the Magspace with the students who made it and Steve (second from the left). What a fine use for his journals, Christine! The journals will be put to good use, and he will be remembered, too. I’m glad you were able to do this. Thanks so much, Margot. Yes, it is a comfort that I was able to do this. Thank you, Helen. Yes, everyone is a winner! Peter would have approved, I hope. This is such a good story Christine…. congratulations … i dread someday having to deal with a large collection of bound Geolological Society Journals ….. With shelf space valued by the metre these days I fear land fill threatening …. Thank you, Helen. I think this can be a real problem for academics (and their spouses!). I haven’t even thought about my own journals yet, dozens of copies of the journal of the Association of Art Historians among others. Thanks, Jo. Yes, hugely comforting. As I sorted through them they seemed also to be a kind of record of Peter’s life and it would have pained me to have to throw them out one day. That’s lovely Chrissie, what a happy ending, and what a tribute to Peter. I love that top photo! Thanks, Moira! 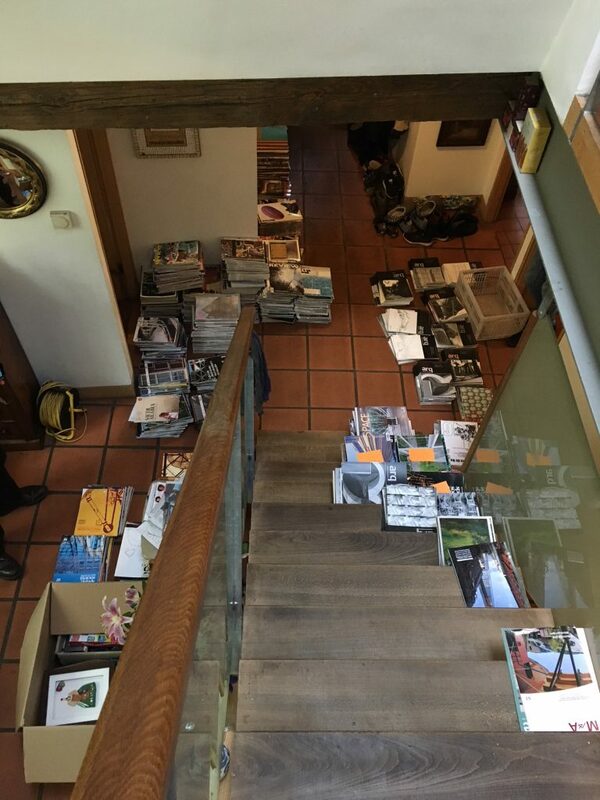 Even that photo doesn’t quite give an impression of the sheer volume of magazines. It’s a great comfort to think of them there.